The U.S. Court of Federal Claims found the Army Corps of Engineers liable for damages caused by recurring Missouri River floods, but not for damages caused by the 2011 flood. 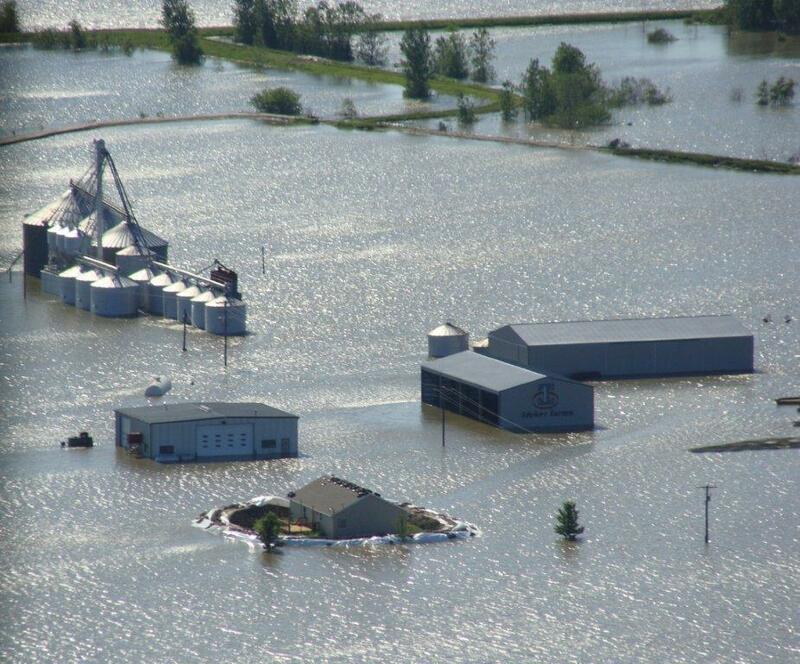 This was lead plaintiff Roger Ideker's farm in St. Joseph during the 2011 flood. The U.S. Court of Federal Claims has found the U.S. Army Corps of Engineers responsible for extensive property damage caused as a result of recurring floods along the Missouri River. A group of 372 farmers, landowners and business owners in several Midwestern states filed suit against the Corps of Engineers in March 2014, alleging that the federal agency's actions contributed to five floods along the Missouri River since 2007. Senior Judge Nancy Firestone ruled on Tuesday that the Corps of Engineers was liable for damages caused by recurring floods. In 2004, the agency began prioritizing wildlife protection and restoration over flood control. The Corps of Engineers' changes to its management practices, which included "reopening historic chutes" and "increased reservoir stage and threatened and endangered species releases," caused riverbanks to erode and contributed to the inundation of private properties, according to the judge's ruling. "We've said all along that this river has changed, and it's changed as a result of the management of the river by the Corps of Engineers," said Roger Ideker, the lead plaintiff in the lawsuit. Ideker is a farmer who owns about 2100 acres in St. Joseph, Missouri. His family has owned the farm since 1952. In the last decade, flooding has breached his levees and ruined his crops, irrigation structures and farm equipment. "This river has been transformed and restored to a more natural state that favors fish and wildlife," said Eddie Smith of the Polsinelli law firm in Kansas City, which represents the landowners. "And regardless of what anybody wants to say, that has put in jeopardy any and all people who live up and down the river." However, Firestone did not find the Corps of Engineers responsible for damage caused by the 2011 flood. The judge's ruling noted that the changes the federal agency made to river flows had the "direct, natural, and probable effect of causing flooding or more severe flooding" for five flood events since 2007. But it added that the Corps of Engineers' actions in 2011 "were not part of the single purpose of meeting the Corps’ obligations to protect [threatened and endangered] species. As such, the plaintiffs will need to separately prove causation and foreseeability for flooding in 2011." The U.S. Department of Justice did not provide a comment. Spokesperson Wyn Hornbuckle wrote in an email that it is still reviewing the ruling. The ruling will only compensate the plaintiffs for flood damage. Ideker hopes that the decision will show the Corps of Engineers that it needs to change how it manages river flows. "We want river management restored like it was prior to 2004, and what that does is give flood control a priority," Ideker said. The Federal Claims Court's next step is to determine how much the plaintiffs will be compensated. The property damages are estimated to exceed $300 million.